Juventus moved three points clear at the top of Serie A with victory over struggling Empoli. After a goalless first half, veteran Andrea Pirlo scored his first goal of the season, striking home a 25-yard free-kick. Carlos Tevez, on as a substitute, had an effort saved and Claudio Marchisio hit the post with the rebound. The Argentine then set up Alvaro Morata, who curled in a second, before Empoli's Lorenzo Tonelli was sent off. Tonelli was shown a red card in the last minute of injury time for fouling Tevez when he was through on goal. The former Manchester United and Manchester City striker was on the bench along with Paul Pogba and Fernando Llorente as Massimiliano Allegri tried to rest some of his key players before their vital Champions League tie against Olympiakos on Tuesday. Juventus have only won one of their three games in Europe so far, while the Greek team are top of Group A. Match ends, Empoli 0, Juventus 2. Second Half ends, Empoli 0, Juventus 2. Attempt missed. Andrea Pirlo (Juventus) right footed shot from outside the box is too high from a direct free kick. Lorenzo Tonelli (Empoli) is shown the red card. Foul by Lorenzo Tonelli (Empoli). Attempt saved. Andrea Pirlo (Juventus) right footed shot from a difficult angle and long range on the left is saved in the top centre of the goal. Elseid Hysaj (Empoli) is shown the yellow card for a bad foul. Foul by Elseid Hysaj (Empoli). Roberto Pereyra (Juventus) wins a free kick on the right wing. Foul by Matias Vecino (Empoli). Attempt saved. Francesco Tavano (Empoli) left footed shot from the centre of the box is saved in the centre of the goal. Assisted by Manuel Pucciarelli. Attempt blocked. Matias Vecino (Empoli) right footed shot from outside the box is blocked. Assisted by Levan Mchedlidze. Corner, Juventus. Conceded by Davide Bassi. Attempt saved. Carlos Tévez (Juventus) right footed shot from outside the box is saved in the top left corner. Assisted by Álvaro Morata. Attempt blocked. Matias Vecino (Empoli) right footed shot from outside the box is blocked. Assisted by Mirko Valdifiori. Substitution, Juventus. Simone Padoin replaces Kwadwo Asamoah because of an injury. Delay in match Kwadwo Asamoah (Juventus) because of an injury. Substitution, Empoli. Francesco Tavano replaces Piotr Zielinski. Attempt missed. Matias Vecino (Empoli) right footed shot from outside the box is too high. Assisted by Daniele Croce. Goal! Empoli 0, Juventus 2. 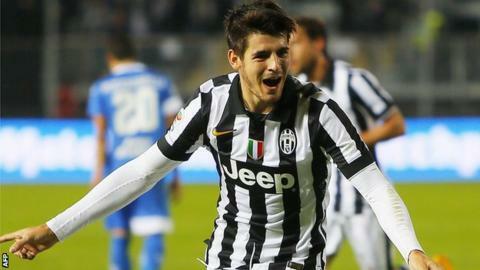 Álvaro Morata (Juventus) left footed shot from the right side of the box to the high centre of the goal. Assisted by Carlos Tévez. Claudio Marchisio (Juventus) hits the right post with a right footed shot from the right side of the six yard box. Attempt saved. Carlos Tévez (Juventus) right footed shot from the left side of the box is saved in the centre of the goal. Assisted by Álvaro Morata. Substitution, Juventus. Carlos Tévez replaces Sebastian Giovinco. Corner, Empoli. Conceded by Claudio Marchisio. Attempt blocked. Elseid Hysaj (Empoli) right footed shot from outside the box is blocked. Corner, Empoli. Conceded by Arturo Vidal. Corner, Empoli. Conceded by Gianluigi Buffon. Attempt saved. Manuel Pucciarelli (Empoli) right footed shot from the centre of the box is saved in the bottom right corner. Attempt blocked. Matias Vecino (Empoli) right footed shot from the right side of the box is blocked.